A busy weekend of DIY again. It wasn’t really planned that way until quite late in the week, perhaps even until Saturday morning. But it ended up being fairly epic in scope. Kate had been finding her clothes all getting a bit uncomfortable and so wanted to go shopping for maternity clothes with her mum at some point. Seeing as we’re away soon it’d be a while before she be able to do it so it seemed like a good idea if they could go this weekend and I’ll do some DIY bits with her Dad while they do the shopping. So they went on a big shopping trip to Manchester city centre and met up with Justin before going over to the Trafford centre. Meanwhile my thinking was I had a stack of smaller jobs I didn’t really fancy doing by myself, I got our garage doors in Fort Mill. Now as great as it would be to finish up the garage, I don’t see it as a top priority right now – it’s more watertight than it was and we don’t need the space in there for anything at the moment and some of the smaller jobs – well they’d never get done otherwise and we wanted to get the furniture moved around to be able to start work on a nursery for future baby Nisbet. So they went off to the shops and up into the loft I went, after a small trip to B&Q for supplies. The lighting in the loft being the first job so as to be able to see more easily in the loft for the rest. Replace bathroom and nursery light switches with pull cord switches, replaced double switch in landing for single switch just controlling the landing light (before it was a bit confusing as the switch for the bathroom wasn’t actually in the bathroom). Fix the ballcock assembly on the header tank for the heating (before I was filling the tank back up periodically). Move the spare bed into the music room having created some space by moving out some shelves and moving round the computer desk. Replace the assembly in the toilet so that when the cistern has filled up it doesn’t keep on dripping water and so eventually overflowing out (but I will miss the spectacular ice formations in the winter). Create a route from by the TV in the lounge to the loft and back down to where the computer is in the spare room with enough space for a run of coax to the TV in our bedroom. No more cabling up the stairs and no more dodgy wireless connection to the mac mini (not the wifi networks fault, I suspect it’s the antennae in the mac mini at fault). Kate also went up to the loft for the first time and went through a load of stuff there so it’s much neater now. Removed door to nursery, going to flip it round so it opens the other way. Kate’s mum did some sanding of the wall where a shower was that we had to rip out when we moved into the house. Kate’s going to tile a bit in there before we put the sink back in – things will look a bit better in there then. cleaned out guttering at front – hopefully it won’t wake us up anymore when it rains heavily. 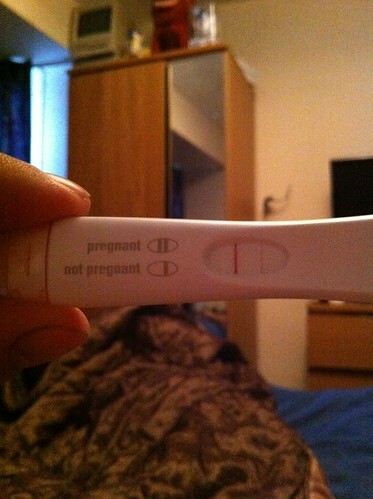 It’s been a while, i’ve been quite quiet of late but I can now post some massive news. We found out just before 6 weeks and we had our 12 week scan on Monday. We’ve been to two midwife appointments so far as well. So that’s the scan picture, I think it’s actually easier to see when viewed upside down. 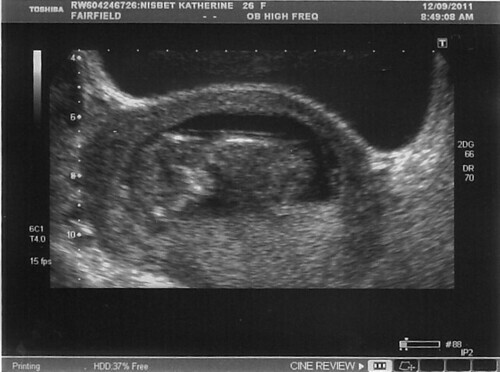 The baby has an ETA of 21st March 2012. So far it’s been great, lot’s of thoughts buzzing around and trying to learn lots about pregnancy and babies. Our families have been great. Our biggest purchase to date has been a deposit on a pram, first of many purchases. We got it after looking at a million of them at the Manchester Baby fair at the GMEX in Manchester and bought it from it turns out, a shop based in Bury called It’s a Baby.